Wearing an apron has long been a habit when you make your step to the kitchen. The apron helps to save you and your clothes from being hurt or dirtied with oil shooting or stain from food, … That’s why everybody try to own one apron. But have you ever thought what is a good apron? Or how to maintain it properly? And what kind of apron is most common? Well, according to what I’ve discovered, the most popular one is the black. 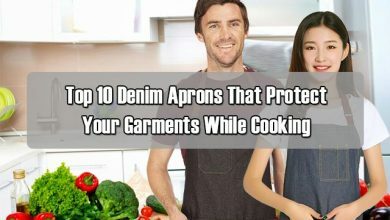 Although there are thousands of choices for apron on the market, a black apron is still the most common choice among professionals and non-professionals. It can bring about the feeling of professional as well as clean and simple. The suitable black apron can help you to stay away from even smells. 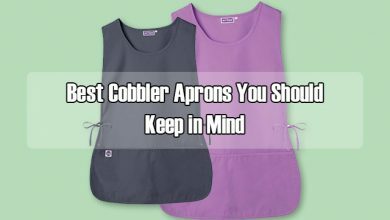 Thanks to those benefits, I spend some time looking for some of the best black aprons and finally came up with this list. Here, I want to share this list with you so that you can gain some information for a best one for you. So, let’s started! This list wouldn’t be complete without this Professional bib aprons, whose quality is so wonderful and price is also reasonable. With a simple yet gentle design, this 32” x 28” apron is created to fit all figures of body, even small or big guys. The black color brings about the professional feeling that you will feel like second Gordon Ramsay. What’s much greater than freely cooking without having to pay attention to the coming stains such as flour, oil, that may get stuck on your clothes. Why? Because thanks to the 100% spun polyester material, this piece of apron will protect you from them. The unit is ideal for both home and business cooking because of its outstanding protective ability. As I said, this piece is made to be simple, therefore, there are no pockets or adjustable neck traps. All it has is an already-attached necktie but you can feel alright because it won’t make you uncomfortable. Around the apron, there are complementing trims which helps it to last longer and more durable. Thus, you can make use of this product by not only for cooking, but also for gardening, crafting and so on. On the back, there are two 37-inch strings to be tied tightly or loosely according to your interest. And one more bonus for this is that the product is made for both men and women, a unisex apron. You can buy one for you can one for your spouse in case you guys enjoy cooking together without thinking what kinds of apron to buy. Keeping and storing is also easy as how it is designed. Just warm water and a little soap are alright by either hands or washing machine. After that, make sure it is dried and then store it in a suitable place for next time use. Overall, this apron is so amazing and useful that you can bring it home now! If you are looking for a water-proof apron that is mild black and long enough, then this Vinyl waterproof aprons is the best choice for you! 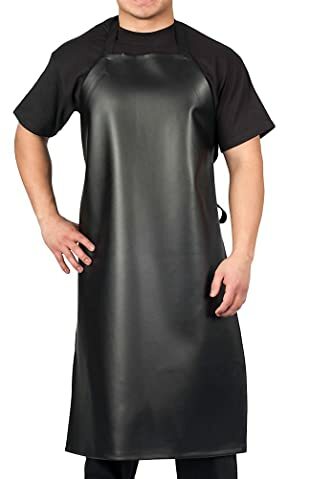 Being made from high-qualified plastic, this mild black apron looks really shiny and special, suitable for those who are a bit strange and modern. Of course, with the new kind of material, the price will be somehow higher but I think it is worth to do so. This vinyl is much larger and longer, therefore it is recommended most for those who are super tall and big. Not only the product can be used for cooking but also for doing gardening, or even bath dogs… and so on. Although the neck strap does not own a clip or adjustable feature, it can still be very comfortable for the users because the length is pretty remarkable, therefore the finished size for this is up to 39”. Thanks to the excellent material, the product is pretty durable and long-lasting as well as lightweight. Besides, it can help you withstand many hardy stains and food grease, especially water as the vinyl is a kind of special plastic. This will certainly help you dry and dry. After using, you should clean it carefully. I think a piece of wet cloth to clean the surface is the best solution for refresh the look and the quality of the apron. Don’t wash it with the soapy water or use a lot of force, which can make your vinyl apron become quickly broken down and distorted. Overall, this is such a wonderful waterproof apron, owning multi functions that you should have in your kitchen. 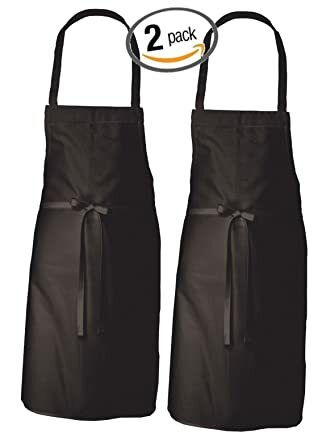 Another unisex model for you is this Adult men’s women’s unisex chef’s bistro adjustable extra-long ties, professional commercial grade bib apron. Each set of products comes with two beautifully-knotted aprons and you can make your choice between 5 color options. The apron is made of durable poly cotton fabric whose quality is excellent and soil-releasing ability is also great. More than that, the product measures to be quite long, 32” x 36” that almost fits all kinds of people. However, it will be a bit difficult to those who are small. The ties are so long that you can even make some … for decorating. Besides, the apron surface is flat and mild, you are allowed to add some patterns or flowered shapes if you would like to. With that extreme length, the utensil can defeat every kind of dusts from the above to the bottom one because it will save you from the chest to the toe. The made of material is super strong that you can both use it for everyday cooking and heavy-duty jobs such as gardening, Similar to the above model, this design does not include any adjustable neck traps, but of course you can still feel free in this design. At the end of the day, cleaning the apron’s certainly important to keep it usable for a long time. All you need to do is put it into a washing machine and dryer and store it in dry place. You can wash it as many times as you want because thanks to the materials, it always stays in first condition for long time. 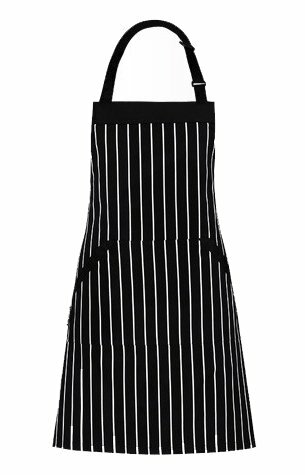 To me, it is one of the most deserved black apron with pockets to be used for your daily cooking jobs. Let’s turn to some pocket aprons. You must be satisfied with this Syntus 2 pack adjustable bib apron waterdrop resistant kitchen aprons thanks to its outstanding quality. Also coming in the list of black aprons, this is a modern design with the measurement of 33” x 27”, pretty smaller than the two mentioned ones. However, I think it is quite suitable and fit to an average number of users. The common version of which thickness is standard to which you can feel fairly comfortable because made polyester, free from toxic chemical and safe to your health. Thus, you may feel really soft when touch the surface of this product. Moreover, added with two large pockets at the front side, this apron certainly become more convenient for you than others which don’t own this feature. Thanks to the adding point, you can put portable tools into them for carrying along with you such as mobile phone, thermometer, or even a small spoon. This black apron with pockets is so clever and gentle that even each stitching is perfectly strong and solid. Therefore, you are guaranteed that this can last for long time without any breakages. It is designed to protect you from annoying cooking stains, kitchen grease, and sometimes, it does act as a towel that you can dry your hands. Just like the other aprons, this can be put into washing machine or by hands for maintenance. Remember not to dry wash since it is not made to do so. Although it seems to be heavy, you may be really amazed at how light it is once you have a chance to try wearing this. Actually, many people complain that this cannot be 100% water proof, but I think a good apron is the one that a help us to stay away from the food stains, and the great points can be well make up for this case. Besides, there may be a small hole for sewing process, but you don’t need to pay attention to this. Overall, this is such a great gift for your everyday cooking because not only it can protect you but also it cheers up your day a lot. Just imagine how your spouse looks in a professional black apron making delicious meals for you! If you want something smaller than the above aprons, then you should consider this Fame adult’ 3pocket bib apron. It looks quite comparable to the #3 apron, with the additional two clips that can be adjusted for loosen or tighten the neck trap in case you feel uncomfortable. The material made of the product is a combination of polyester and cotton that totally satisfies you because this is a kind of quickly dry and excellent stain-preventing one. I must say this is a fit apron that best suits for almost everyone, especially those who are small, measured at about 24” x 28”. Besides the black color, there are a large number of choices for you to mix and match with your clothes, making you not only protected in such apron but also be fashionable. The stitches are also strong and level that they cannot easily come out even with hard force. The three pockets on the front side are really useful for you to hold small stuff such as cell phone or a recipe book and alike. The middle one is larger than the remaining two in which you can put more things into that pocket without being afraid of not enough space or breakage. Some people ask me about how to maintain the product. Well the answer is to wash it regularly to get rid of the dust and stain stuck on it. Remember to separate it from the light color and wash it with warm water. After that, store it in suitable place for next time use. One tip for you is that you can buy another one for using in garage or garden to protect yourself from making your clothes dirty. 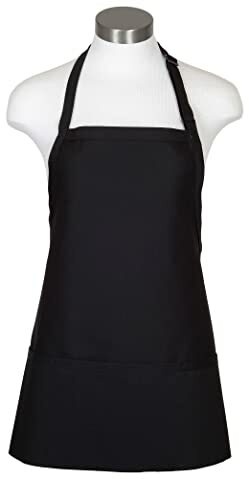 Overall, this is an affordable black apron with pockets that owns many good features and deserves to appear in your daily cooking job. 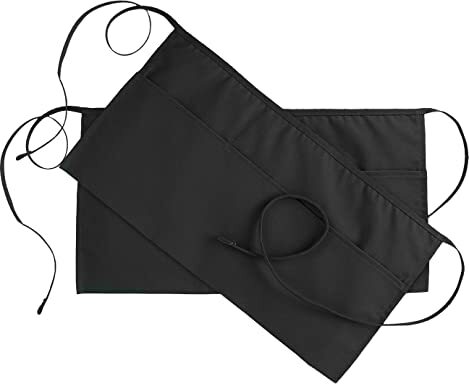 With the half length of normal apron, this black waist apron is designed to tie around your waist. This set of products includes two aprons that is actually useful for daily working. The material is polyester that’s string and perfect for such usages like serve and cook. This feature gives the product a shiny feeling as well. Similar to other three-pocket aprons, on the front side of this piece, there are three one that can allow you to hold more things, such as a small notebook with a pencil for noting every comment or order from the customers. You can imagine how professional you are in this set making some cocktails or baking breads. Simple as it may seem, to keep it for long lasting is not easy at all because there is something you should remember. Never wash it with warm water or use dye or bleach when washing. Or you should keep this piece apart from the lighter garments. The long strips that you can tie a beautiful knot around your back allow you to loosen or tighten the apron according to how you like it to. Moreover, the price of this set is also reasonable and all the products are equally the same therefore it can be used as uniform aprons. This is a great black waist apron with pockets. Overall, this is the great choice of waist apron thanks to its good quality and good price. 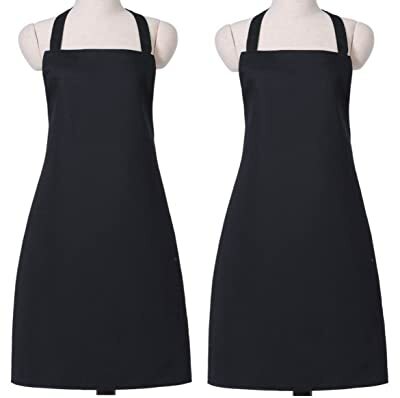 Another waist apron that you will totally impressed is this Dickies chef men’s unisex waist apron whose design is quite similar to the mentioned apron. This Dickies is much longer and owns only two pockets. With the measurement of 29” x 30”, it is such a long apron for a waist one which can save your garments from many and many food stains and kitchen grease. Made of 65% polyester and 35% cotton, this combination will make you cool and dry. The materials also make the unit lightweight and durable so that it lasts longer. On the front side, there are two large pockets for you to hold different convenient things such as cell phone or a book, and you can feel comfortable about that since the pockets are deep, not so shallow as other apron’s pockets. Ideal most for waiter and waitress, barista and bartender, but this is also used in kitchen, or if you want, you can still use it for gardening and wooding, … But I think it is not very suitable in those cases, right? The string for tying is also long enough to simply knot around the back. Of course, there are some other choices for colors, but this black is one of the most classical models for anyone crazy about tradition yet modern. To maintaining this product, you can both wash it by hand, or by a washing machine. And then dry it for the next time use. In case you don’t use it, just put it somewhere dry and easy to find in your kitchen for proper storage. To me, the waist apron sometimes can make you feel different and inspire you with many yummy dishes. So just try it! If you are looking for a professional apron just like the above one but at more reasonable prices, this Hudson Durable Goods Apron would be my pick. “All for one and one for all” is what I can say about these aprons. They own many plus points that ranging from professional to commercial uses. These not only should appear in your cozy kitchen, but they can assist the guys in your garage or garden as well thanks to their utmost durability. I must say, this Hudson apron is similar to the above one in some ways. For example, the simple design, the two clean colors and the high-qualified fabric which is 100% Cotton, etc.… However, it still has its own style to shine with the “thousands” of pockets and various sized features. These three-large pockets at the front side of the product are so helpful for those who have to use it all the time! The secret of convenience lies in the cross-back strap design which does not tie around your neck, reducing pressure put on it. Instead, it has a clip making it easy to adjust and put on so not easy to come off. Moreover, this apron is so easy to be cleaned-up as well but remember not to bleach and keep it separately in case there are color bleeding situations. Thanks to the material made of, this product is especially durable and strong. Besides, one bonus for this is the solid and thick stitches on the top and bottom for strength and structure as well as the metal grommets and rivets. All of these features can make your apron become stronger and more comfortable. 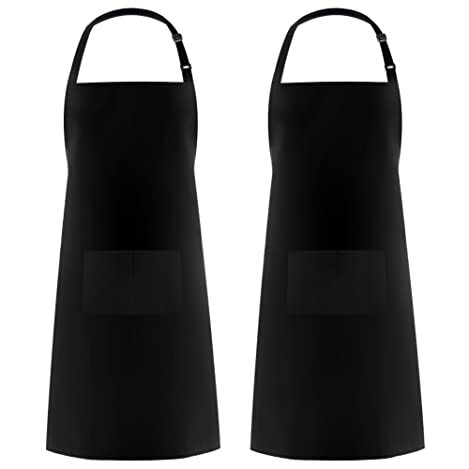 “Strong” and “multifunctional” are two of the greatest features of this black apron with pockets besides “easy to clean” and diversified sizes. This is the idealist apron that modern people should own in their kitchen. Another wonderful apron that amazes you is this Dii cotton adjustable buffalo check plaid apron of which quality is excellent. 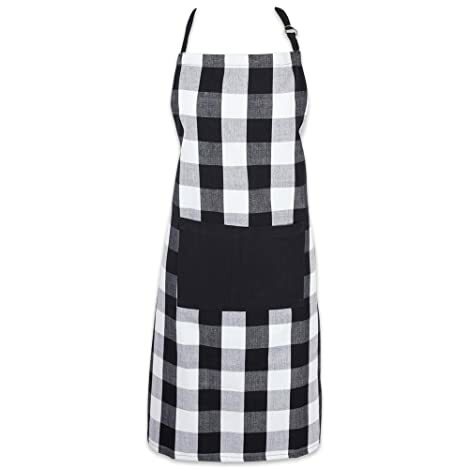 Different from other mild black one, this large-checked black and white apron really stands out from the rest not only for its design, but also for its lightweight materials. Made of 100% cotton, this’s really well-dry therefore you will feel totally cool and comfortable while wearing this. Although it is not water proof, its ability to dry is fast so that it won’t take you long. The large black pocket at the front is embroidered strongly and solidly into the apron that you can hold almost every necessary thing for your cooking such as a guide book, a spoon, or even a mobile phone, every stitch is all clever and strong, which makes the product to be durable and last for long time. However, the pocket is rather shallow, which sometimes annoys you a little bit. In addition, the apron is equipped with an adjustable clip, thanks to which you are able to alter the size and width of the neck, providing you the most convenient experiences. Whether or not this is easy to use is the most common question. Well, you just put on the apron, adjust the width and tie the knot behind your back. And tada, your apron is ready to protect you from unwanted stains and spills. Cleaning is also a simple story that you may find because you can both wash it by hands or in washing machine. And you don’t need to separate it from other light color clothes as well, thus saving your more time. To me, this modern apron is best deserved to be your choice! An if you want to find out something more, than this list of white aprons may be a good option for you to think of for more information. Another suggestion from me would be this Homwe adjustable bib apron with pockets for women and men. Since its appearance, these unisex aprons have caused a very hot trend in every country that they go through. Actually, these unisex aprons have almost similar features compared with others, since they are also 65% Polyester and 35% Cotton. To me, these wonderful aprons are the best gift that you can choose to give your love-cooking spouse. This apron is so special because of its white striped design. I must say this makes you become more and more fashionable with your clothes. This kind of color combination is a great and classical one that will make your experience when cooking much funnier and happier. I myself really enjoy this model because of its unique feelings brought to me. One of them is the two-sided pockets that are different from the above pockets. Thanks to the strong stitching, you can be confident to put everything into the pockets without being afraid of ragged. Measured at 27” x 33”, this piece of cloth provides great coverage and protection from spills and kitchen stains. One bonus point is the two clips on the neck strap for adjusting the width of it so that you can feel the most comfortable while cooking. The string that tightens to your waist can be knotted into a beautiful ribbon, which can add more patterns to your simple apron. 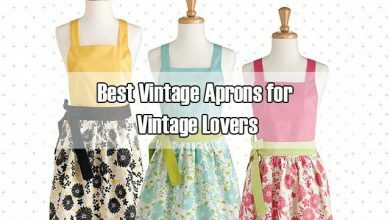 These aprons are good choice for those searching for a very classic looking design and they also come with reasonable prices as well. Also, it is easy to keep for a long time. 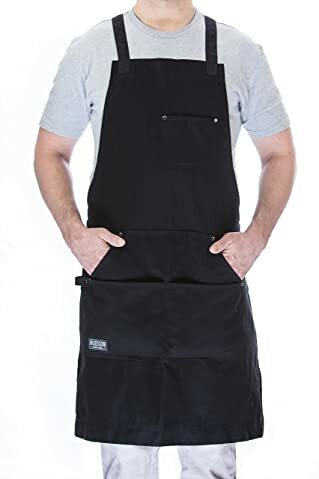 Overall, this black apron with pockets is deserved to be invested for long use and also you can find out more about other aprons with pockets in some of my reviews for more information. These aprons, without a doubt deserve to be invested on thanks to the excellence in the design as well as experience that they create. After reading this review, I hope that you will have a closer view at this field, find you your very own apron and enjoy the benefits that these can bring about.